One of our biggest questions for Star Wars: Galaxy’s Edge is how will Disney handle the crowds. People are still arriving at the Animal Kingdom two hours before the park opens to beat the crowds at Pandora- World of Avatar. The fan base for Star Wars is much larger than Pandora. If allowed, some Star Wars fans would camp out several days to get into the park. The only thing that Disney has announced is that to visit Star Wars: Galaxy’s Edge at Disneyland Park between May 31, 2019, and June 23, 2019, guests will be required to make a no-cost reservation (subject to availability) to access the land. Disney will need to do something beyond June 23 at Disneyland and in August when the land opens at Walt Disney World. This blog post is just wishful thinking. We have no information from Disney about what they are planning for crowd control into Star Wars: Galaxy’s Edge. I’m 100% certain Disney will do something, but we do not have details about what their plans are at present. With that said, here’s some Armchair Imagineering. My first idea is to have the exit of Millennium Falcon: Smuggler’s Run to take users out of the land. This would give a constant flow of guests exiting the land, and allowing a constant flow of guests into the land. Here is my elaborate idea for entering Galaxy Edge. It makes the entrance an experience of its own. 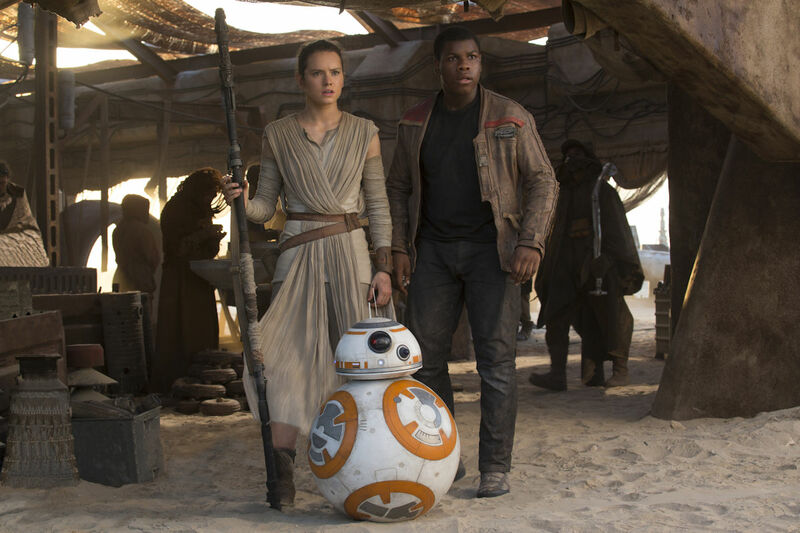 The queuing process will transport guests from central Florida to a galaxy far, far away. Guests may arrive 5 hours before the park opens. Guests wanting to arrive at that time will have to walk or take private transportation as Disney transportation will not start running until 2 hours before the park opens. Guests can enter Hollywood Studios 4 hours before the park opens. Guests will go to the Indiana Jones Epic Stunt Spectacular theater where Star Wars movies will be playing. Guests will be seated in the order they arrive, and will be released in the same order. The amphitheater holds 2,000 people. An overflow queue will be set up around Echo Lake. Starbucks and Backlot Express will be open serving coffee and breakfast. The next stop for the queue experience is the Grand Arts Theatre (aka the Muppets theater). The Resistance has taken over the theater. The movie will be replaced with a film with Rey and Finn looking for recruits to join the Resistance. People willing to join the Resistance will be given a “boarding pass” to take a Star Speeder 1000 to Batuu. The boarding pass will be a FastPass+ for Star Tours. The last three simulators at Star Tours will be used for the Galaxy’s Edge queue. A new video and storyline will be used for the ride to Batuu. For people prone to motion sickness there would be an option to ride Star Tours without motion. When the flight is complete, you will exit Star Tours in the opposite direction to a backstage area. The backstage area will be themed as the spaceport on Batuu. The spaceport will have bathrooms facilities, food, and drink. You will be able to signup for Savi’s Workshop and learn more about Batuu and Black Spire Outpost. The spaceport will be partially a queueless queue. When it is time for you to leave the spaceport your boarding pass group will be called to go through customs. Don’t tell the officers that you have joined the resistance or Stormtroopers may take you away. The queuing process can take less than an hour if you do not have to wait between the Muppets’ Theater, Star Tours, and the spaceport. 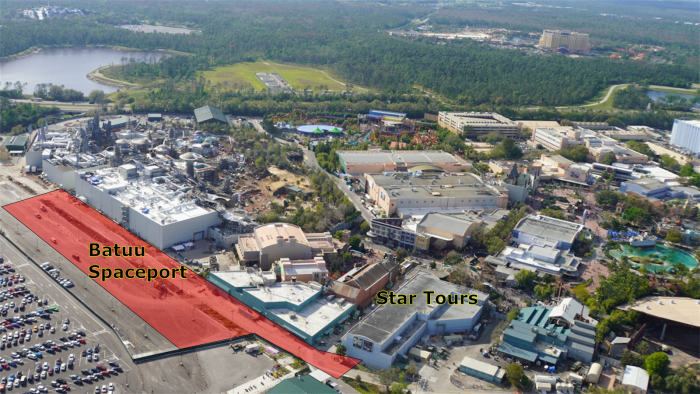 Further in the day, the time between the Muppets and Star Tours will grow. The time before Star Tours will be the time you can visit other attractions in the park. The last boarding pass time will be 3 hours before the park closes. Once all the boarding passes have been distributed, Muppet Vision 3D will return to Grand Arts Theatre. The cast members at Muppets will have no idea what Galaxy’s Edge is or that the Resistance was there. Since Galaxy’s Edge will be using the spaceport as a temporary entrance, the two permanent entrances to the land will only be used for exiting. The first 2,000 people into the Indiana Jones Theater are expected to be through the queue by the time the park opens. Boarding passes will likely run out before noon. No boarding pass means no entrance to Star Wars: Galaxy’s Edge for that day. On days with Extra Magic Hours, the Indiana Jones Theater will be divided by on-site and off-site guests. Off-site guests will be held back until the park opening. All on-site guest that arrive before the park opens will be allowed ahead of the off-site guests in the queue. 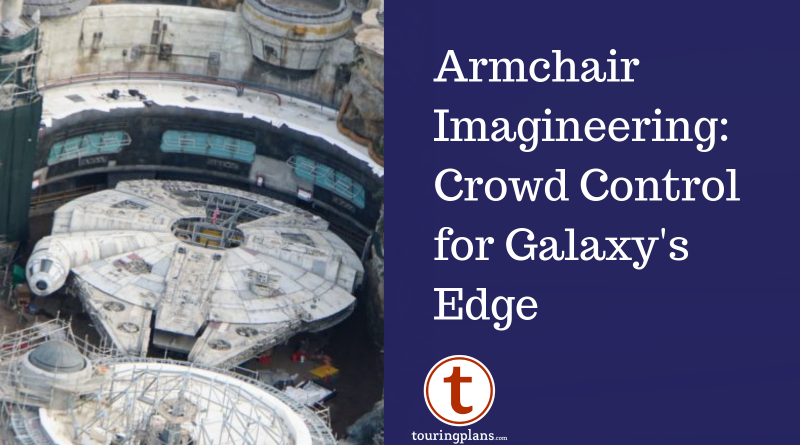 As we mentioned, this is just a bit of Armchair Imagineering to figure out how to handle the large crowds that will descend on Disney’s Hollywood Studios for Galaxy’s Edge this fall. It’s clear that Disney will need to do something to manage crowds and capacity issues, and we all eagerly await news about what their plan will be. If you were in charge, what would you do for crowd control at Star Wars: Galaxy’s Edge? Let us know in the comments. I would do the same as DL. 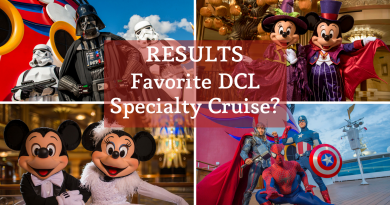 Only difference would be only deluxe resort guests and those who booked prior to the announcement will have first crack. I love starwars but was pretty ticked at Disney for throwing one heck of a monkey wrench into an otherwise relaxing (as relaxing as you can get at WDW) vacation booking for when it was supposed to be somewhat lower crowds. same here, our labor day week trip we planned because we wanted to avoid star wars was totally knocked off the rails, two days after making our dining reservations. steve, this is golden, and i hope someone from disney really does read this. i’m really crossing my fingers with all of what TP has been saying about SWGE opening in florida, knowing it’s all your opinions but your opinions are super smart. i just cannot fathom a universe where they allow it to simple be a free for all. our trip labor day week was completely derailed by this news, and there is still so much in HS our family wants to visit that is not SW, and we’re worried about being able to get into the park. these separate ques you’ve come up with would be our saving grace. i’m of the opinion they are going to take what works at disneyland and apply some parts of it to HS. everyone thinking there won’t be some kind of special ticket/reservation/separate entry i hope will be ready for one. it’s really the only fair, chaos-controlled way to do it, speaking from safety alone. My only critique of this is that it seems like a lot of work when they’re already work8ng their butts off to finish what will open. I think the ides that the MF ride loads out is interesting, but what would the people that ride it right away think? I think it will quickly become known that this land is a lot more than just the rides. it’s been hyped and built up, intentionally or not, by media and bloggers since the moment it was announced. look at what happened with pandora and toy story land, and multiply by 10. i’m not looking forward to it at all given that we’re unintentionally going to be there opening week and had our trip booked long beforehand. The best way to have crowd control for this park is wait 5 months before visiting. Harry Potter, Pandora…all where slammed for the first few months. Now, they’re normalized and inline with other “E” ticket attractions/parks. we had our trip booked labor day week based on that “late fall” window disney kept pushing. this screwed up our whole trip, and we can’t go another time right now. we’re stuck. i just hope lots of other people heed this advice and don’t come opening week. We are visiting in December and aren’t desperate to get on the rides at SWGE but would love to be able to get in to the park. I’ve not booked a hotel yet but I’m thinking that it’s a good idea to book a Disney hotel because we’ll have the best chance of being able to reserve a pass to enter SWGE? What are your thoughts? Do you think it’s more likely to be reserved for deluxe hotel guests? I’m looking at Art of Animation specifically. they haven’t announced any crowd control measures or plans for florida yet, only disneyland. If they reserve it just for deluxe resort guests they will lose us as guests. That would be ridiculous. If Disney gives an advantage to onsite hotel guests, I would expect it would be offered to all onsite guests. Deluxe Club level gets extra services, but I don’t think that would be required for the advantage. Star Wars: Galaxy’s Edge will have Extra Magic Hours, and that would only be for onsite guests. Onsite transportation to Hollywood Studios might be easier than dealing with the parking lot. For Art of Animation, you will be able to take a gondola to Hollywood studios. I don’t know if there will be any other advantage to onsite guests.